We must learn how to read Scripture. It is not lessons of the past, but the reality of God’s presence among us today, in the here and now. One of the most frequent ways that Jesus steps into our lives is by his works of healing. In Matthew 11:5 Jesus tells us, “the blind regain their sight, the lame walk, lepers are cleansed, the deaf hear, the dead are raised, and the poor have the good news proclaimed to them.” Today we hear this good news, today the blind see. Jesus often gave sight to the blind, telling them, “Your faith has saved you.” This is what he says to the blind man of Jericho. He cannot see who Jesus is, but when those around him say, “Jesus is passing by,” he immediately shouts as loud as he can, “Jesus, Son of David, have pity on me.” For Jesus, though he is the Word of God, has become one of us, of the family of David. We might think that the gospel is about physical sight, but it is more than that, it is why faith is necessary. All of us, whether physically blind or spiritually blind, need Jesus who said, “I am the light of the world.” This is why we call baptism “enlightenment.” This is why we must confess that Jesus came to save sinners, “of whom we are the first.” We can say this sincerely, because we know the power of sin in our own hearts, and not in the hearts of others. Our Lord says of Peter, “Blessed are you, Simon son of Jonah. For flesh and blood has not revealed this to you, (Simon has confessed Jesus to be the Messiah, the Son of the living God) but my heavenly Father. And so I say to you, you are Peter [the rock], and upon this rock I will build my church, and the gates of the netherworld shall not prevail against it” (Matthew 16:17-18). The faith of Peter is the very foundation of Christ’s Body, the Church. And it is established on this impetuous, sometimes weak and imperfect human being, a man who denied Jesus, but wept in repentance, a man who walked on water but began to sink because his faith weakened, a man who was indeed to lead the Church, but only in the grace of the Spirit. Today we celebrate his chains, the imprisonment he suffered because of his faith. Therefore, he is a model for all of us – faith is our “rock,” but we are weak, we sin, we need the forgiveness and grace of God to live a Christian life. And, like Peter, we will have to suffer because of our faith. Peter likewise is the model for the whole Church, for its bishops and leaders, who often, like Peter, stumble and fall, yet on these weak human beings faith is secured by the operation of the Holy Spirit. 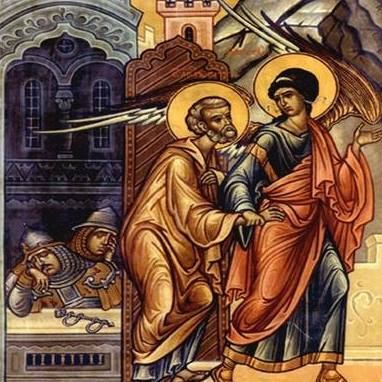 The Roman Church celebrates the chains of Peter on the 18th, and a week later, the 25th, the conversion of Saul, who from a persecutor of the faithful, was transformed by a vision of our Lord, into Paul, a great Apostle. To mark these two feasts, the Chair of Unity Octave was established, from January 18 to the 25, now called the Week of Prayer for Christian Unity. The Byzantine Church celebrates great Church teachers on these two days, Saints Athanasius and Cyril of Alexandria on the 18th and Saint Gregory the Theologian on the 25th. It is a perfect time to pray for the necessary unity of the one faith, which can be established only on the one God, Father, Son and Holy Spirit, founded, as it is, on our weak human powers which have divided the garment of faith and which can find union only in the power of the Holy Spirit. 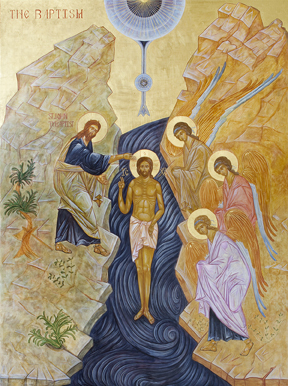 The feast of Theophany is not only about baptism in water, but about the gift of the Holy Spirit. The Kontakion declares, “You have revealed yourself to the world today; and your light, O Lord, has set its seal on us.” When we enter into the life of the Trinity, we receive the gift of the Spirit as the priest anoints us with the words, “the seal of the gift of the Holy Spirit.” We find this phrase in the Epistle of St. Paul to the Ephesians, “In [Christ] you also, who have heard the word of truth, the gospel of your salvation, and have believed in him, were sealed with the promised holy Spirit, which is the first installment of our inheritance toward redemption as God’s possession, to the praise of his glory” (1:13-14). Today in the Church, there is a movement called the “charismatic movement.” It wants to re-emphasize that all who have been baptized into Christ have received the gift of the Holy Spirit. This manifests itself in different ways according to our individual talents. On the Sunday after Theophany, St. Paul says, “And he gave some as apostles, others as prophets, others as evangelists, others as pastors and teachers, to equip the holy ones for the work of ministry, for building up the body of Christ, until we all attain to the unity of faith and knowledge of the Son of God, to mature manhood, to the extent of the full stature of Christ” (Ephesians 4:11-13). The Spirit is given so that Christ may live in us according to fullness. When Communion is distributed, the Body and Blood of Christ are united in the cup with the words, “The fullness of the Holy Spirit.” Why are these charisms, these spiritual gifts, not more evident today? Perhaps it is because we are not as open to hearing the Spirit within us, there is too much individualism and pride. The Spirit is given that we might support one another in community, the Spirit does not support our own ideologies, but the truth of God. The words of the gospel and the teaching of the Church cannot contradict the Spirit, but we sometimes give them our own interpretations. The Spirit truly guides us to truth, as Jesus promised, “when he comes, the Spirit of truth, he will guide you to all truth” (John 16:13). However, we must not hear what we “want to hear,” nor the echo of our own thoughts, but only the working of the Holy Spirit, leading us to the Father through Christ. We ought to be concerned to know and appreciate the place of Sacred Scripture in our worship of God in the Divine Liturgy. No Catholic can be ignorant of Scripture because we would be ignorant of Jesus Christ, to paraphrase St. Jerome. 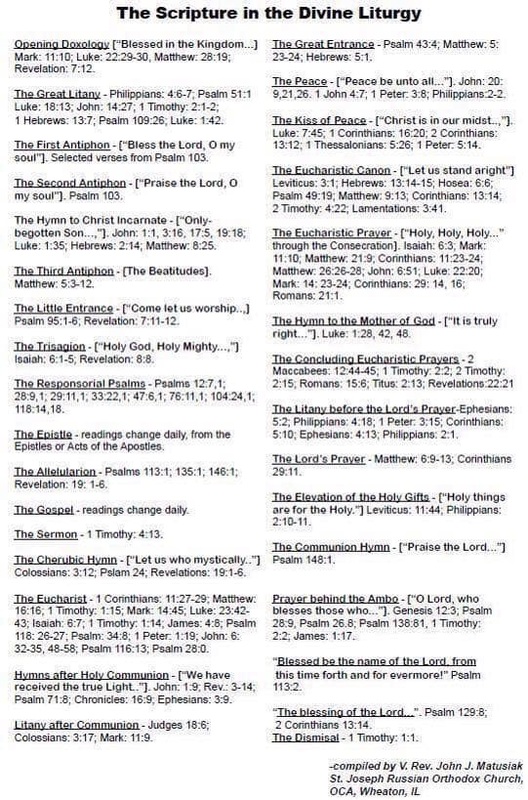 Click on the image to enlarge, and perhaps print the page for your prayer book and bible. On this Sunday, we commemorate three men who had a relationship with Jesus: David, his forefather; Joseph, his foster father; and James, his brother through Joseph. Each of these man were shown mercy by God. David committed a great sin, to win the wife of Uriah, he had Uriah put into the front lines of battle, so that he was killed. The prophet Nathan brought this sin to light and David did repentance and lost his son. Joseph found Mary pregnant and decided to divorce her, but an angel told him to take her as his wife. James was among Jesus’ relatives who did not accept him as a prophet, but after the resurrection, he repented and became the leader of the church at Jerusalem. 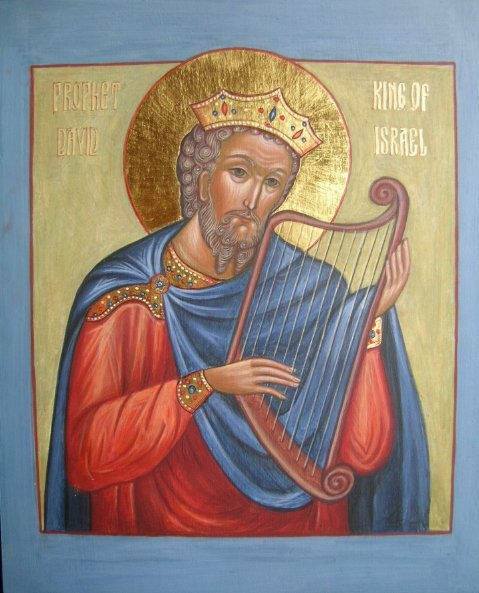 We might also mention Ruth, who was a foreigner – like the Magi. She married a Hebrew man from Bethlehem who died, and Ruth followed her mother-in-law back to Bethlehem, and there tricked Boaz into marriage, becoming the great-grandmother of David and ancestor of our Lord. We might also mention Tamar, who lost her husband, whose brother refused to have children by her. She disguised herself as a prostitute and became pregnant with her father-in-law, Judah, who wanted to have her executed for prostitution until he was shown to be the father. So she, too, became an ancestor of Jesus through trickery. Does not today’s feast remind us that we all have a relationship now with God through our Lord Jesus Christ and we are all in need of his mercy. As we think theologically and personally about the meaning of Christmas, these words from a homily on the Gospel of John by Saint John Chrysostom may help us focus on what it means to say we have a Messiah. After Andrew had stayed with Jesus and had learned much from him, he did not keep this treasure to himself, but hastened to share it with his brother. Notice what Andrew said to him: We have found the Messiah, that is to say, the Christ. Notice how his words reveal what he has learned in so short a time. They show the power of the master who has convinced them of this truth. The reveal the zeal and concern of men preoccupied with this question from the very beginning. Andrew’s words reveal a soul waiting with the utmost longing for the coming of the Messiah, looking forward to his appearing from heaven, rejoicing when he does appear, and hastening to announce so great an event to others. To support one another in the things of the spirit is the true sign of good will between brothers, of loving kinship and sincere affection. 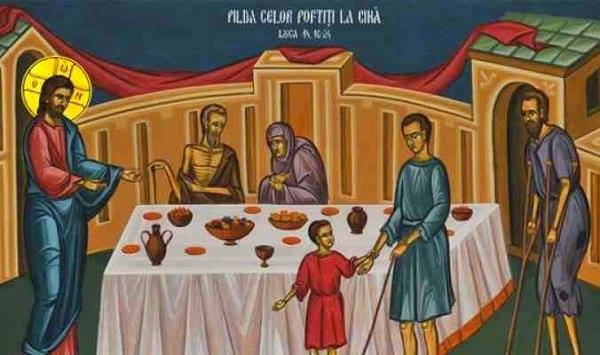 Notice, too, how even from the beginning, Peter is docile and receptive in spirit. He hastens to Jesus without delay. He brought him to Jesus, says the evangelist. But Peter must not be condemned for his readiness to accept Andrew’s word without much weighing of it. It is probable that his brother had given him, and many others, a careful account of the event; the evangelists, in the interest of brevity, regularly summarize a lengthy narrative. 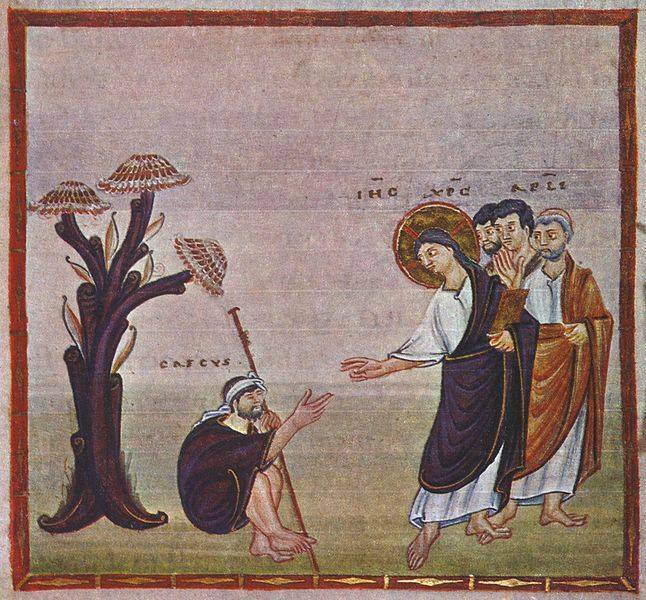 Saint John does not say that Peter believed immediately, but that he brought him to Jesus. Andrew was to hand him over to Jesus, to learn everything for himself. There was also another disciple present, and he hastened with them for the same purpose. When John the Baptist said: This is the Lamb, and he baptizes in the Spirit, he left the deeper understanding of these things to be received from Christ. All the more so would Andrew act in the same way, since he did not think himself able to give a complete explanation. He brought his brother to the very source of light, and Peter was so joyful and eager that he would not delay even for a moment. 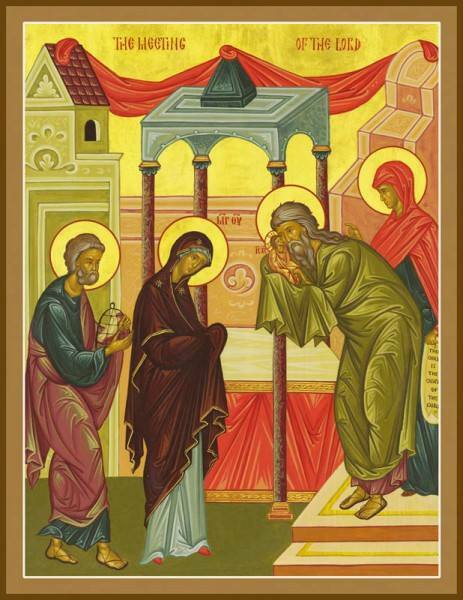 The Byzantine liturgical calendar of the Ukrainian Church has given us today the feast of The Three Holy Children. The feast day commemorates a most fascinating event (experience) of people of faith in the face of evil. The “thrice-blessed ones” are the Three Holy Children, Shadrach, Mesach, and Abednego, kinsmen of the Prophet Daniel in the tribe of Judah, led away together with him and other Jews into Babylonian Captivity. King Nebuchadnezzar had the three youths thrown into a fiery furnace, (in which they famously remained unharmed), after they refused to worship a golden image of Nebuchadnezzar, which he had constructed and ordered the people to worship (Dan. 3). Why does this story receive so much “press” in our Church’s liturgical tradition, and especially in the weeks preceding Christmas? Because it signifies the Incarnation of our Lord Jesus Christ, on several levels. First, it reflects Daniel’s interpretation of King Nebuchadnezzar’s dream (Dan 2: 31-35), in which a statue made of expensive metals was destroyed by “a rock hewn from a mountain, not by human hands.” The Church understands this “Rock” to signify Jesus Christ, called in our Church’s hymnography the “Rock Hewn Not-by-Hands” (λίθος ἀχειρότμητος / камень нерукосечный), from the “Mountain“ that signifies the Holy Virgin. The power of His coming to us in the flesh destroys the “power” of false deities, “circumscribed by hands.” The faith of the Three Youths, in the True God, overcomes the “power” and fiery flames of Nebuchadnezzar’s falsehood, prefiguring the ultimate victory of Jesus Christ, our death-trampling Lord. 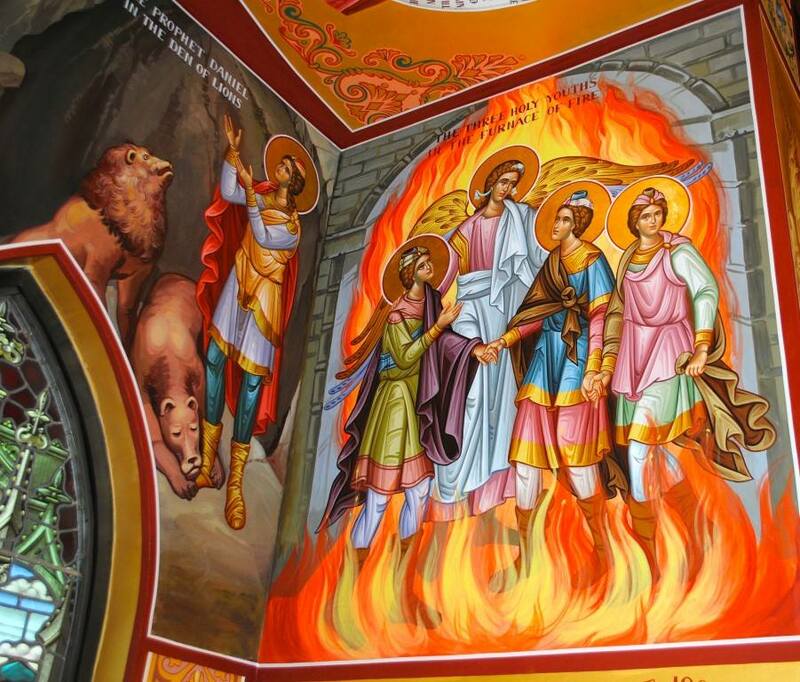 And second, the fiery furnace, in which the Three Children remain unharmed, signifies the Virgin Birth, because the Theotokos’s virginity remained intact, and she –unharmed, even though she received, and gave birth to, the “consuming fire” Who is God Himself (Deut. 4: 24). “And let the peace of Christ control your hearts, the peace into which you were also called in one body. And be thankful” (Colossians 3:15). “And one of them, realizing he had been healed, returned, glorifying God in a loud voice; and he fell at the feet of Jesus and thanked him. He was a Samaritan. Jesus said in reply, “Ten were cleansed, were they not? Where are the other nine? Has none but this foreigner returned to give thanks to God?” (Luke 17:15-18). This Sunday comes between two great feasts: thanksgiving and Christmas. On Thanksgiving we feed ourselves with the bounties of God’s creation, and, hopefully, thank him for these blessings, because, as we pray in the common Ambon Prayer, “you are the giver of every perfect gift.” On the coming feast of Christmas, we are already thinking of what gifts we can give to each other, and parents will teach their children to give thanks to everyone who gives them a gift. The word for gift in Greek is “eucharist,” which means “to really show favor to another.” If someone shows favor to us, it is humanly natural and normal for us to show favor in return according to our means. Jesus comments the even sinners do good to those who do good to them (Luke 6:33). Of course, sometimes that doesn’t happen and we call that a betrayal. On Christmas, God is the one who shows the greatest favor, as the angels sang at his birth, ““Glory to God in the highest and on earth peace to those on whom his favor rests” (Luke 2:14). This gift is God’s only Son, whom the Father gave to the world “so that everyone who believes in him might not perish but might have eternal life” (John 3:16). This is so important that we repeat this passage from Scripture in every Divine Liturgy of St. John Chrysostom. This gift is also the gift of peace, for St. Paul tells us that Christ is the peace of God, “For he is our peace, he who made both one and broke down the dividing wall of enmity, through his flesh, abolishing the law with its commandments and legal claims, that he might create in himself one new person in place of the two, thus establishing peace” (Ephesians 2:14-15). 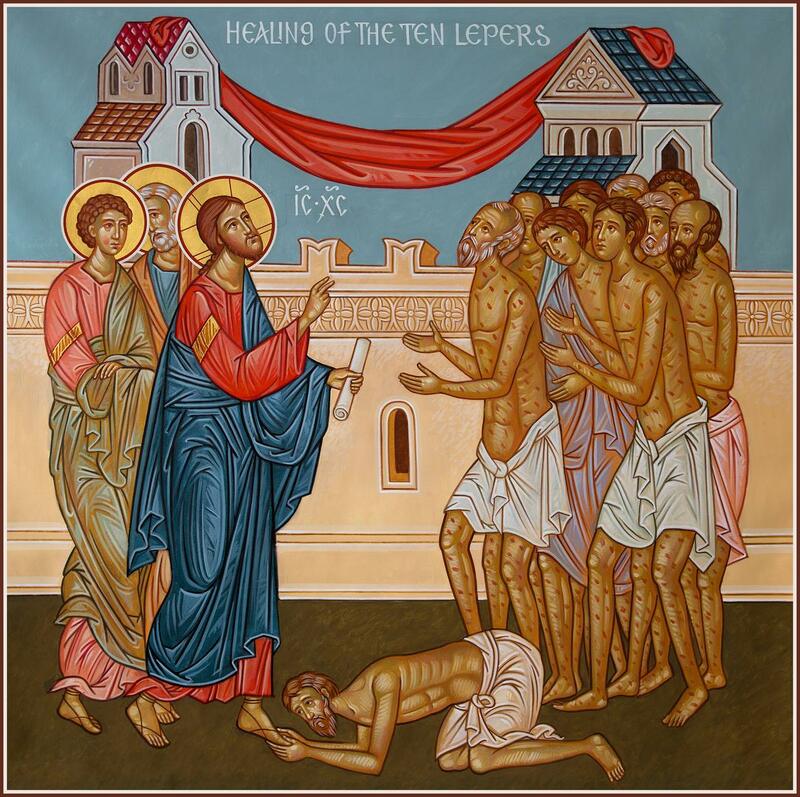 For this, like the healed leper, we must give thanks to God. But if God shows us this great favor, “what,” as the psalmist says, “can I return to the Lord for all he has given me?” (Psalm 115:3). God has no need of anything that we can give him. What we can give him is our sacrifice of praise, our words of glorification. We are like the little drummer boy in the popular Christmas sing, “I played my best for him.” Precisely in receiving God’s gift of love and peace, we are ourselves transformed into God’s love and peace, so that St. Paul tells us in today’s epistle,. “let the peace of Christ control your hearts,” so that we can “put on then, heartfelt compassion, kindness, humility, gentleness, and patience, bearing with one another and forgiving one another” (Colossians 3:12-13). To do this would be our Christmas thanksgiving.